After leaving university with an apprehensive and uncertain predicament that the education provided has left her discouragingly unprepared for the competitive world as a jewellery maker, Vanilla Ink founder Kate Pickering identified the huge contrast between making jewellery and becoming a jeweller; inspiring her to set up an initiative to support, assist and mentor those who needed to take the confident leap into the jewellery industry. Based in Dundee, Scotland and founded in 2009, Vanilla Ink has flourished and continued to go from strength to strength with a prosperous future ahead of them; the possibility of launching a second initiative in the UK. As an avid user of social communication and highlighting the importance of interacting with fellow designers, jewellery admirers and those connected to the industry, Vanilla Ink recently held a social media fortnight with an introduction to the current crops of young talents (or otherwise affectionately known as inkers) residing in the jewellery incubator. After viewing their diverse, quirky and personable collections I am intrigued to find out more and the inspirations behind their work. 1. 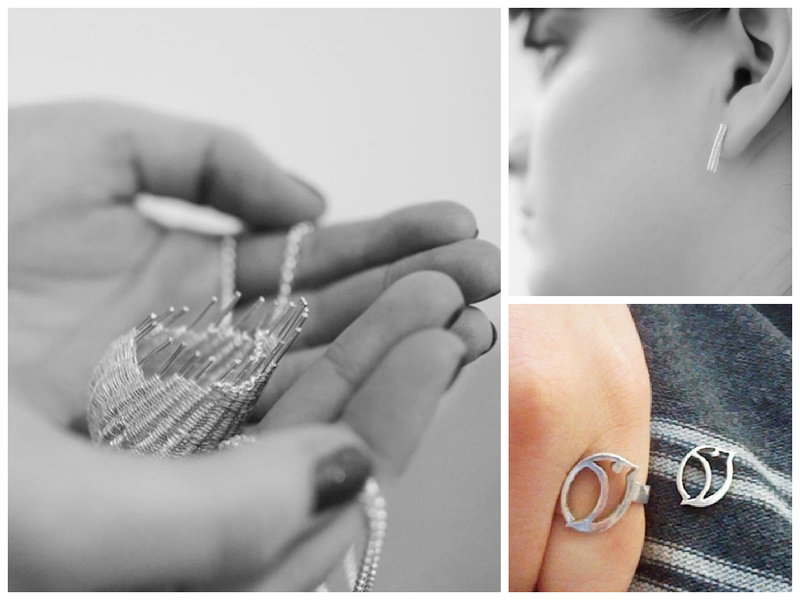 So can you describe your jewellery in 5 words? Pamela Goodman: FIERCE. ALTERNATIVE. FASHIONABLE. STATEMENT... & fierce again. Just because. Shira Goldberger: Classy, glamours, different, feminine, contradicting! 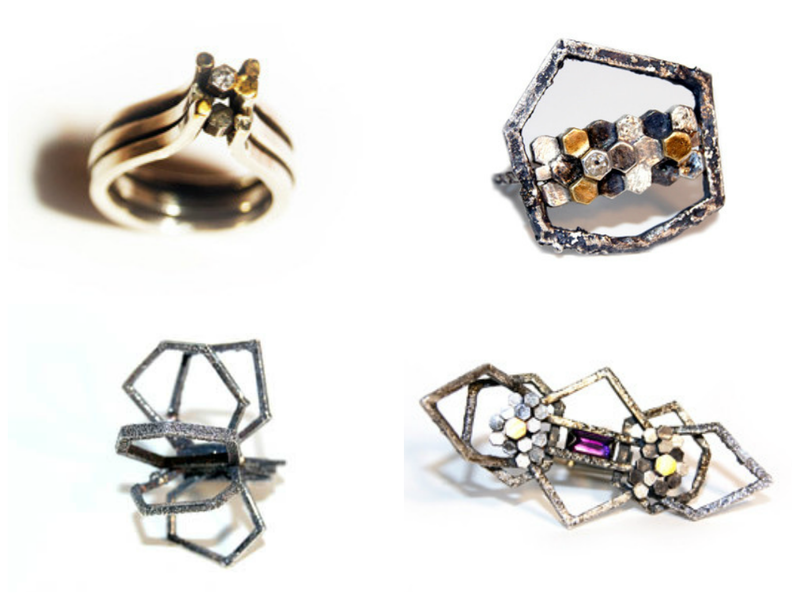 Kirsty Stewart: Sparkly, shiny, feminine, precious, handmade. Mairi E Collins: In 5 words I make "otherworldly biological mixed metal oddities"
Lucie Hunter: Can be described as Precious, Contemporary, Scottish, Rough & Smooth! Kirsty Stevens: Print-based, turning a negative into a positive! 2. What are your inspirations? Kate Pickering: Music and my surroundings! Would love to create a Dundee collection! Kirsty Stevens: I am inspired by the life long condition which I suffer from, Multiple Sclerosis! 3. If you could collaborate with any brand who will it be? Lucie: I would love to collaborate with Naromode the Glasgow fashion brand, Beautifully wistful clothing! Pamela: Where to start; Moxham Store, Malice clothing, JC Shoes, Jane Gowan, Topshop, Abandon Ship Apparel. Karen: Definitely Voodoo Vixen they are a vintage inspired clothing brand. Love their clothes! Kirsty Stewart: I'd love to collaborate with By Charlie's Hand. I love her little bird cut outs. Kirsty Stevens: It would be House of Hackney the luxury life style brand! Robin: That guy I see in the mirror every morning, he's pretty great. Failing that... Michael Berger. Elizabeth: Not a brand as such but a collaboration with The Mak Lab would go down pretty well! 4. Is there a jewellery designer you look up to the most? Who influences you and why? Robin: Friedrich Becker! Just amazing! Elizabeth: Not a jeweller as such but Iris Van Herpen is a pretty inspirational designer and user of new technologies! Karen: I try not to look at other jewellery designers. However skill wise I admire Andrew Berry. Amazing jeweller! Mairi: Ah man that's an impossible question! Out of the inkers I particularly admire Joanne Macfadyen for her awesome style. 5. Describe the person wearing your jewellery. Kirsty Stewart: I'd say someone who likes to wear individual pieces and who loves bling. Robin: All sorts of people and that's how I like it. I'm never stuck in a 'niche' or have a target market. Shira: Stylish, intellectual, well-travelled, not afraid to be a little different. Mairi: minimalists with an interest in science, fashion and futurism. 6. What is your favourite piece from your collection? Elizabeth: My most recently made creation is my favourite! 3D printed nylon, baroque pearls, adorned with pink pearls and silver! Robin: Gotta be the robins! Pamela: I love my maxi shard neck piece but at present I'm obsessed with harnessing! Lucie: My 'Wave' Ring,1st piece of current collection I felt embodied Staffa perfectly! Mairi: I love my stacks! 7. What do you specialise in? Kirsty Stevens: Right now I am experimenting with screen printing, that will become my speciality! 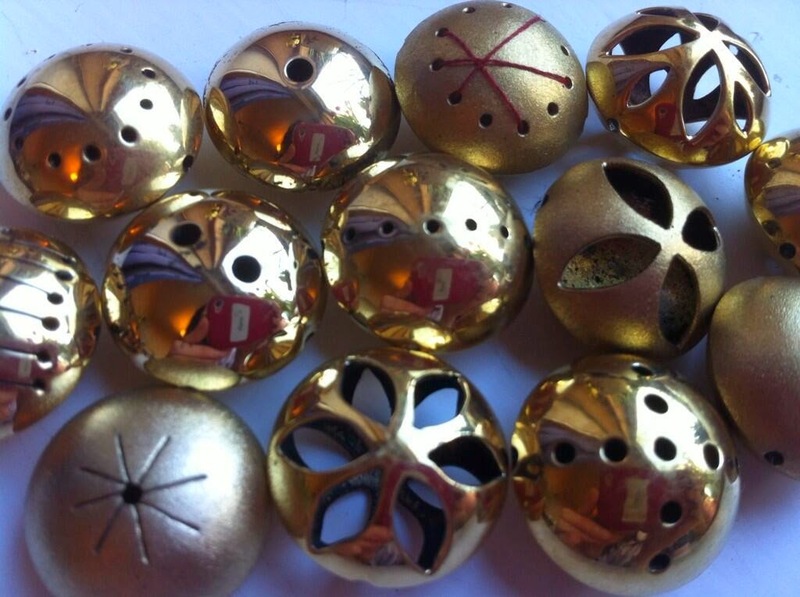 Pamela: Creating statement wearables using a mix of leather and precious metals! Lucie: Specialise in re-creating Scottish landscape using Precious Metals, Hope to start bespoke pieces soon! also eating biscuits at every available interval. 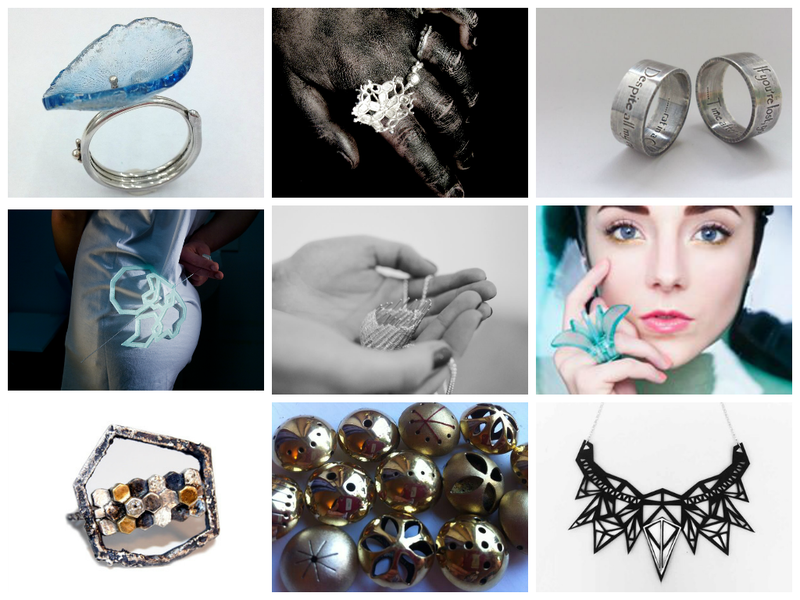 Kirsty Stewart: Probably stone setting, I love stones and bling! Robin: I think I'm more of a generalist. Although being the only guy I do have a lot of patience! 8. What advice you would give to someone just starting out in jewellery? Karen: Be prepared for a lot of hard work. It's not for the faint hearted. Time management is key. Robin: Even award winners don't get success over night. Be ready to work hard! Lucie: Starting out is hard, maintaining enthusiasm is harder! New projects and always good to keep energy levels high! Kirsty Stewart: Be committed, it's a tough business but it's also very rewarding so just don't give up. 9: How do you relax when you're not making jewellery? Mairi: I play in a rock band when I'm not making jewellery...maybe not so relaxing but I love it! 10. What have you got from Vanilla Ink so far? Kate: some amazing friends and constantly surrounded by talented jewellers. Pride! And always having access to amazing jewellery. Mairi: Vanilla Ink has given me biscuits, jewellery banter and access to the big giant blowtorch. Lucie: Gives me reassurance, we all specialise in different areas but all go through the same battles! Pamela: Confidence and belief in my brand and products. It's important to have reassurance & peers for advice when it gets tough! Kirsty Stewart: I have gotten new creative people in my life, and a whole new business plan! Love it! Elizabeth: A huge boost in confidence, better time keeping skills, some great jeweller company! 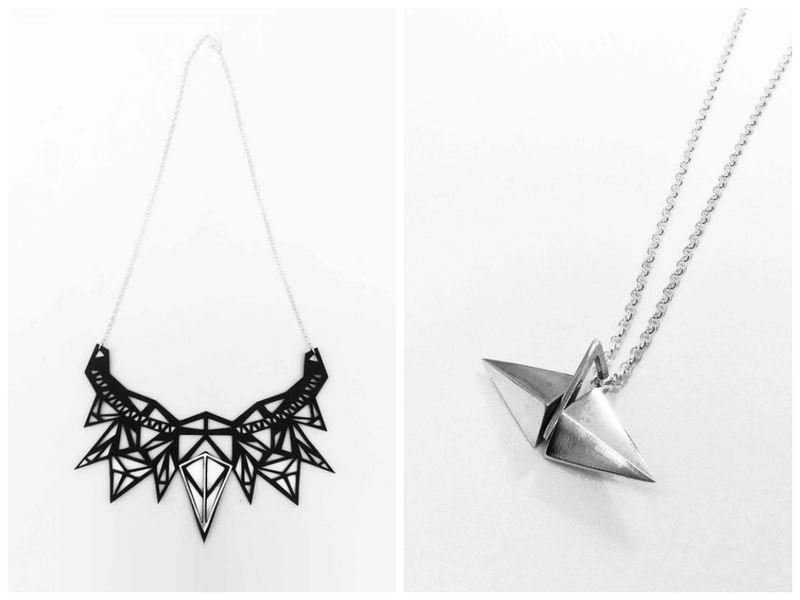 Elizabeth graduated from Duncan of Jordanstone Dundee in Jewellery and Metalwork in 2012. She is inspired by leafy flora-fauna and hidden gems found on the forest floor and ocean bed from the West Coast of Scotland's Trossachs region where she originates from. 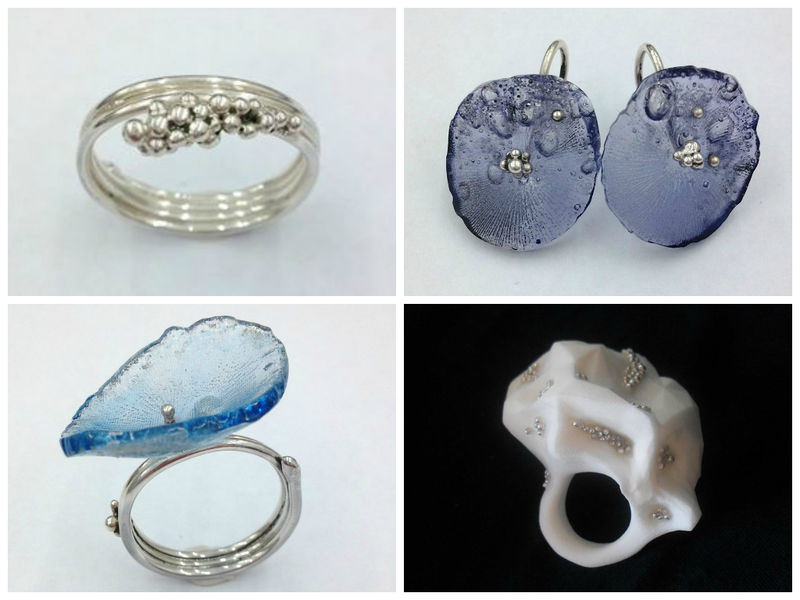 Textures, colours and forms from these appear in Elizabeth's jewellery in mixed media. 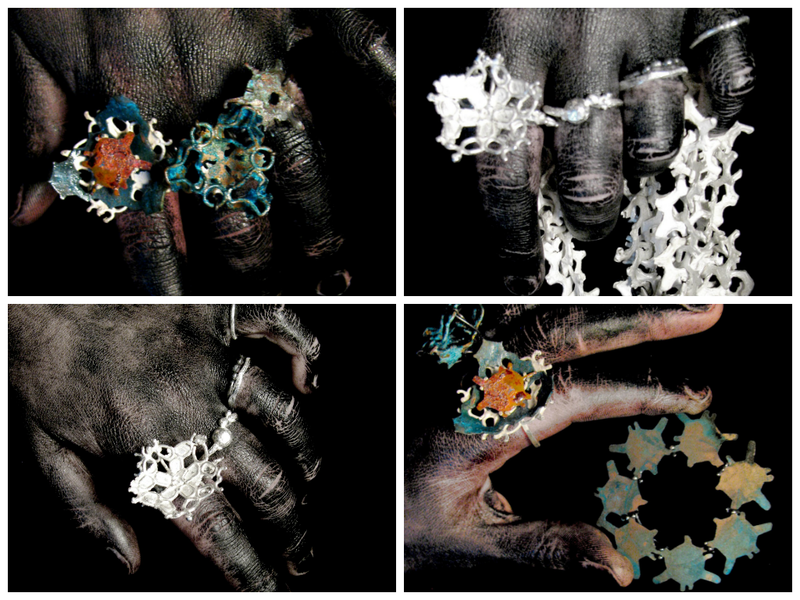 She aims to push the materials she uses in her jewellery to test their boundaries and create large, beautiful and completely unique creations. 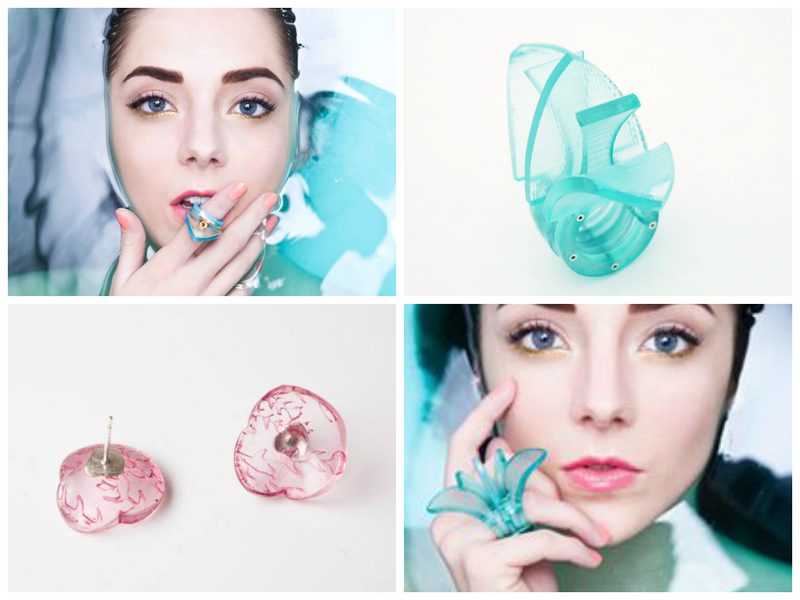 Graduated from Duncan of Jordonstone College of Art & Design, Karen Smith creates weird and wonderful jewellery that has a narrative quirk with a personal touch; burying stories and secret meanings beneath the surface engaging both the wearer and viewer. She draws influences from song lyrics focusing on the emotions they conjure and translating them into her quirky narrative creations. A keen traveller, it provides an additional source of inspiration for her work. Kirsty is inspired by the condition she lives with, Multiple Sclerosis. Each piece was inspired by what she had experienced since diagnosis. She examined the visible lesions on her MRI scans and used these scars to turn them into something beautiful and unrecognisable. While playing with these interesting shapes, she noticed an occurring theme that reminded her of victorian decor. She began to design her own prints using the lesion as the main focus. Lucie's collection is inspired by places that holds special memories and hope’s to help people re-connect with the land they live on. The Isles of Iona and Staffa hold a special family connection in Lucie’s heart. She explores the innate affinity we have with our natural surroundings and environment and believes this plays a part in our instinct to pick up mementos, objects which help us retain emotional connections. A graduate of Glasgow School of Art in Silversmithing and Jewellery Design, Mairi main visual influences are scientific illustrations and microbiology. She reconstruct their irregular repetition, textures and shapes in metal using a variety of techniques. In her degree collection she experimented with surface texture and patination to give a biological look. Her current collection interprets the microbiological theme as a range of high-quality wearable pieces. Pamela's Jewellery brand Pretty Vexed is influenced by the notion of empowerment and the effects a statement piece can have upon the wearer. By using predominately leather and precious metal, her over sized, bold, imaginative creations is aesthetically menacing, encourages the feeling of caution as well as the curiosity to touch. Graduated from the Birmingham School of Jewellery, Robin goes by the name of theweerobin. He specialises in weaving of metals and minimalist jewellery for everyday wear, finding inspiration in basketry, engineering and male grooming. 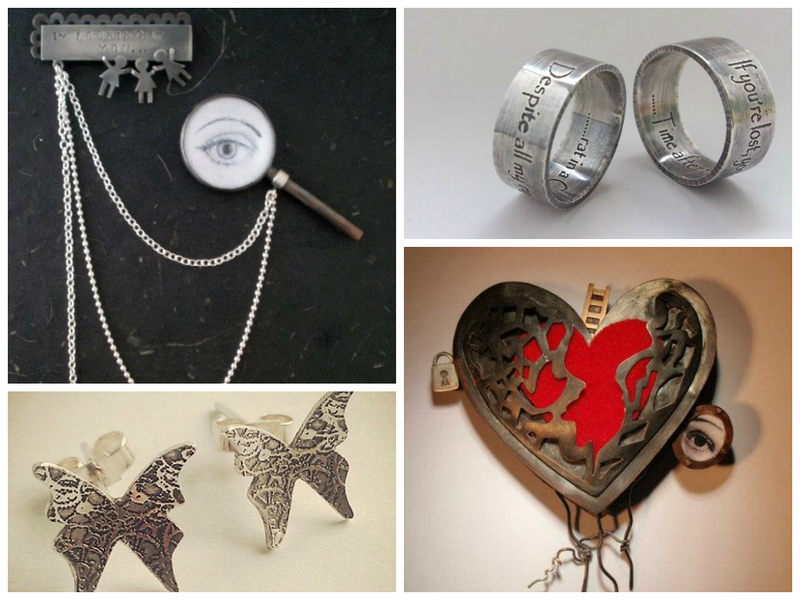 Shira Goldberger is an art Jewellery designer. Originally from Jerusalem, Israel, she has graduated with a BFA in the department of Jewellery and Accessories design at the Bezalel Academy of Arts and Design. In her work Shira is creating conflicts and contradictions as a form of finding identity, while her main inspirations are the city of Jerusalem and modern ideas of feminism. 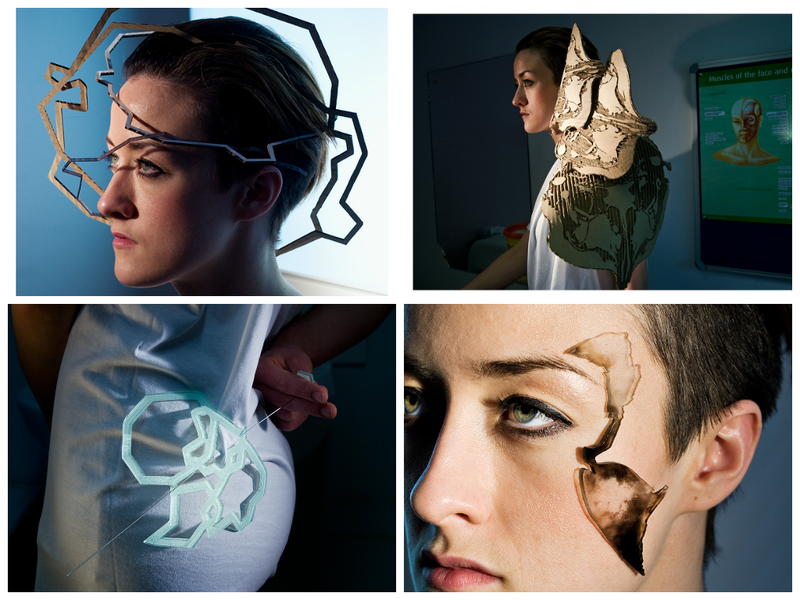 Kirsty Stewart graduated from Edinburgh College of Art with a BA in Jewellery and Silversmithing. Kirsty is influenced primarily by nature, in particular she is inspired by her surroundings in the Fife countryside. She investigates plants, shells and birds, and finds interesting shapes, patterns and textures within these. She is also interested in the reasons people wear jewellery and how it emotionally connects them.